For years, great architects have talked of masterful play of material, space and light. With this, there is a whole world of possibilities when choosing a window. It may seem deceptively easy, but there is so much to consider in the seemingly simple act of placing an opening. Often, my favourite buildings are designed from the inside out; the ‘inside’ takes its cue from the outside. This doesn’t, mean that the exterior of a building isn’t important — anything but. However, the selective and particular capturing of a shaft of sunlight can transform a space from banal to sublime. is it to capture a view? is it to ventilate a space? is it to bring in light? 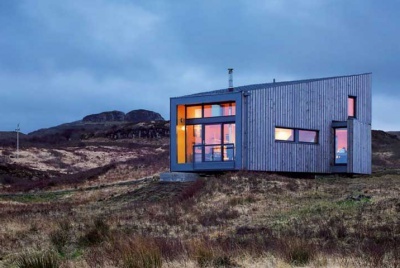 If it is to primarily capture a view, where should it be placed in a space, and what shape does the window need to be? Constructing a sequence of spaces that orientate you to different aspects of your surroundings is an incredibly important part of designing a house. Remember, one of the points of designing your own building is to make it site specific, rather than just like every other house. Consequently, it’s a great idea to place openings to show things in an orchestrated way. 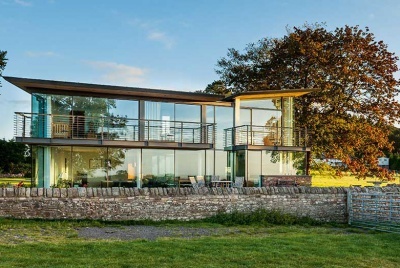 In my own house, for example, when you arrive from the outside you can see right through the building and down to the valley below, thanks to two glazed walls in the kitchen. The idea is that visitors are given the big picture of the lie of the land before they enter a much more closed part of the house. As you move upstairs, other aspects of the surroundings are revealed and defined through glazing. Windows need to bring in specific light at certain times of the day, and the most useful harnessing of solar energy is not for solar panels, but instead for naturally lighting homes. In the UK, it is possible to design houses to almost never need the lights on during daytime. It is important to bring in natural light early in the mornings, after cool nights. Accordingly, at my house, we have high-level first floor clerestory windows that are designed to capture the first rays of morning light. 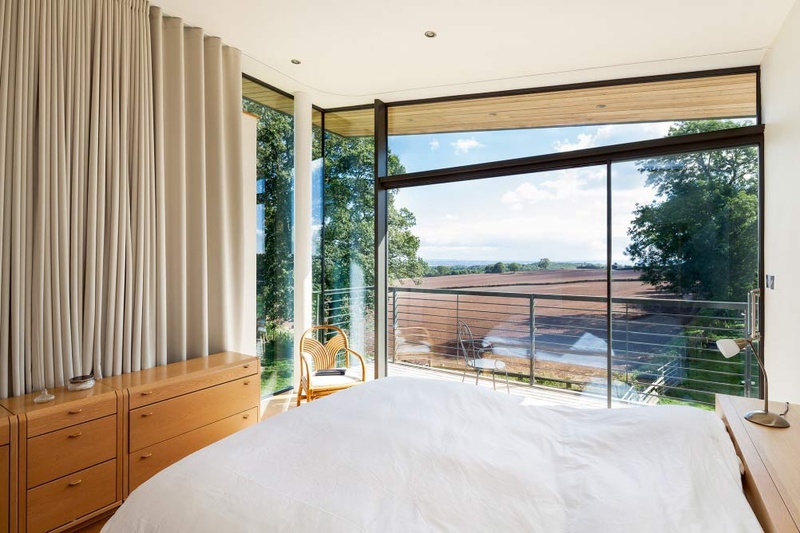 When bringing in natural light, west-facing windows are very difficult to deal with, as overheating is often an issue. But, if the view is to the west, this is where the fun starts in design terms — dealing with the seemingly conflicting issues that you can resolve in an interesting design solution, with an extra deep reveal or external shading, or angled flanks to a window. Winter sunlight is essential too, and can act to generate the most interesting architecture. There’s a great scheme for a new build that Gianni Botsford Architects designed for a shaded site in London that generates its entire form from reaching up to ‘grab’ winter sunlight. Similarly, my own practice have often designed window box light scoops that capture otherwise inaccessible southern light and bring it into the building. Privacy is also a big deal for most people — and I’m no exception. One of my big hates, though, is frosted glass. In parts of the upstairs of our house we wanted to be able to walk around without being seen from the footpath nearby; consequently we have a low-tech series of external timber louvres that allow us to see out, but don’t let passersby see in. The filtered light and view that comes through these louvres is one of my favourite parts of the building. What I’ve been saying is that there is a seemingly obvious and critical relationship between window positioning and the site. I’m always shocked how few buildings acknowledge where they are — or, if they do, they have the most banal windows that do little to exploit the delight in designing site-specific openings. All of this, of course, is before I have even talked about where and how a window sits in a wall, or what it is made of. There’s nothing wrong with an ordinary window per se, just that an ordinary window is put in lazily without due regard for its wider relationships. There’s a big interest in contemporary architecture in ‘flush skin’, which means pushing windows right out to the extreme edge of the building face. This can look great, but detailing the thermal envelope can be complicated. In Georgian times, they were masters at ‘building in’ frames to make the overall appearance seem much more slender. This is something I enjoy nowadays too, and with timber cladding it is easy to conceal the entire frame, giving windows a very slender look. The proportions of the window openings is critical too. I’m a big fan of asymmetrical glazing bars, as opposed to equal pairs. Similarly, my least favourite window opening is the equal pair of patio doors. Far better to have three – or, an unequal pair of a fixed panel with a slender frame – and an opening leaf with a chunky ‘defined’ frame. Taking this one step further, it can be great to separate ventilation from light. I’ve often used fixed and frameless glass, with an adjacent opening timber vent. This means that there’s no need for an expensive glazing system, and more opportunity to use the performative aspects of a building to articulate it — or define the design. This brings us to the material itself. Undoubtedly, PVCu is my (and probably everyone else’s) least favourite window frame material. 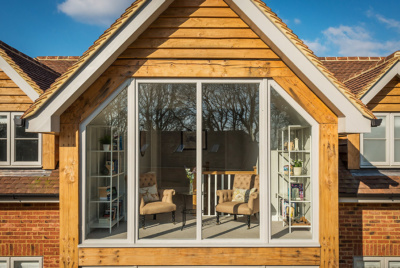 Timber has had a bad rap in the past, but a well-detailed timber window can now last almost indefinitely. They can be made to order very cost effectively, and spray painted in the factory. 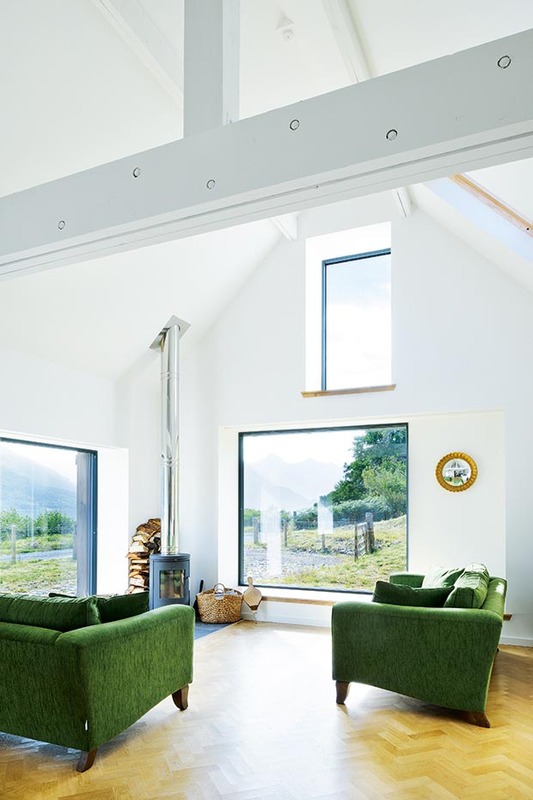 Thermally broken aluminium, however, is probably the most versatile material for window frames — and looks great, typically when powder coated a dark colour. Far from being a specialist item, there are now many small window manufacturers that buy in window sections and make windows to order. Finally, rooflights are amazing. 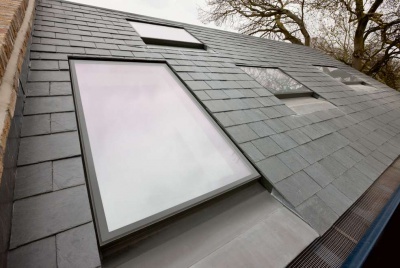 They are useful high-level vents to let out hot air, and one square metre of rooflight brings in three times as much natural daylight as one square metre of window — perfect for lighting up your home.